Property Assessed Clean Energy financing or "PACE" can make it easier for owners of commercial, industrial, multifamily and nonprofit properties to obtain low-cost, long-term financing for renewable energy projects. Your business or organization can apply for 100 percent financing for clean energy improvements such as installing solar. (The program is also available to homeowners in California, Florida and Missouri.) Cities and counties work with private-sector lenders to provide this financing for qualified projects, with the loans paid back through an annual assessment on the borrower's property tax bill. As an independent third-party facilitator, SunPower has helped secure financing for large solar power plants, small family businesses and public projects. In fact, we provide access to Power Purchase Agreements (PPAs) for smaller systems that have historically been challenged to find a financier. We also help our customers use public financing, such as Clean Renewable Energy Bonds (CREBs) and special government programs. With PACE, the payback term may extend up to 20 years, which can save your business money by ensuring that your yearly utility bill savings from your energy improvements are greater than your annual PACE payment. 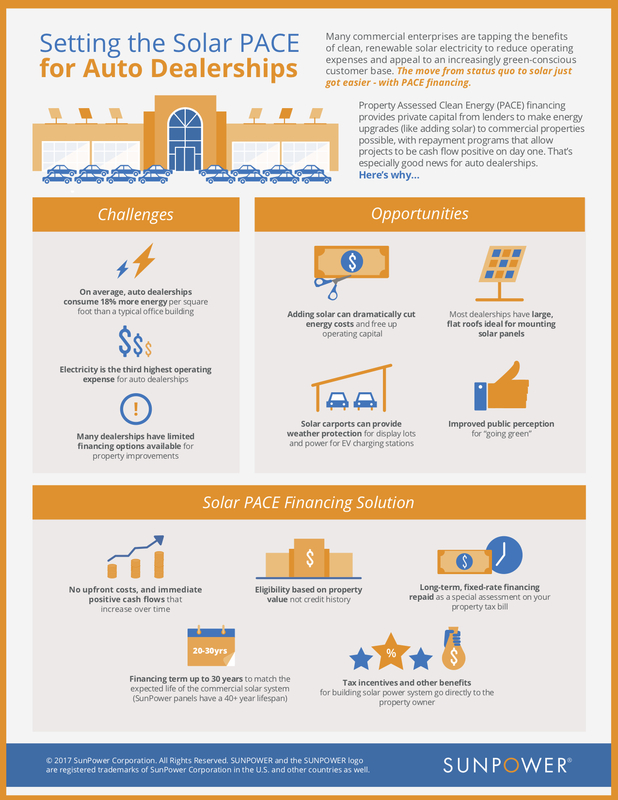 Check out this quick guide to see how PACE can help one sector of the business community — the auto industry — that's currently embracing solar energy. Visit SunPower to learn about commercial solar financing and to see whether PACE might help your business or organization save money with solar.